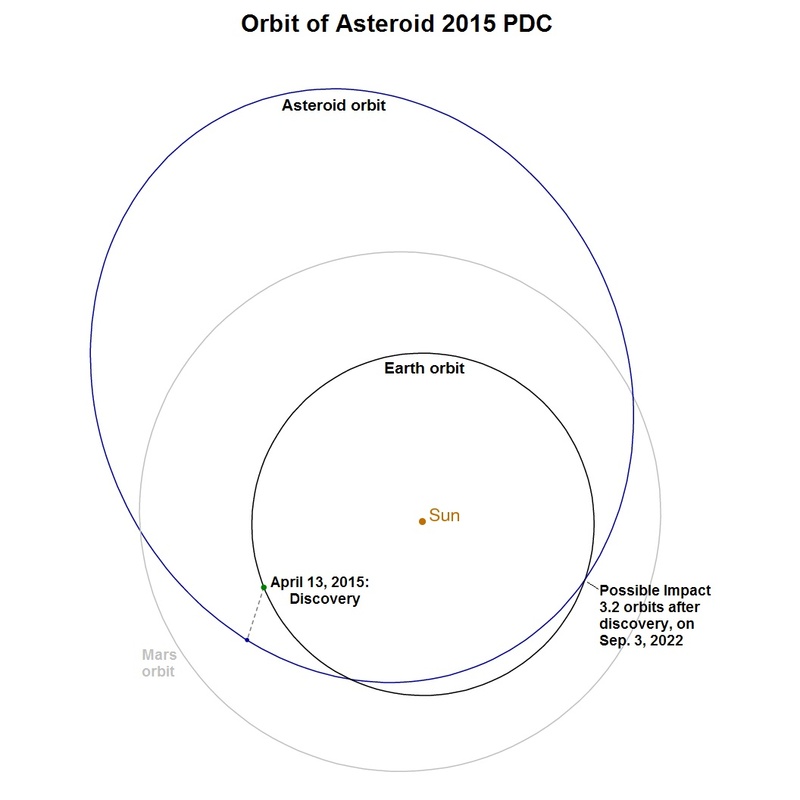 Orbits of asteroid 2015 PDC, Earth and Mars. The positions of the Earth and asteroid on the day of discovery are noted. The asteroid's orbit crosses that of the Earth at the intersection point on the lower right. The asteroid makes over 3 orbits of the Sun between discovery and the potential impact while the Earth makes over 7 orbits about the Sun. In other words, the potential impact occurs the third time the asteroid passes through the orbit intersection point after discovery. A close-up view of the point where the asteroid's orbit intersects the Earth's orbit, with the Moon's orbit shown for scale. When the Earth reaches this intersection point on Sep. 3, 2022, the asteroid is predicted to be somewhere within the red uncertainty region, a small section of which cuts through our planet. 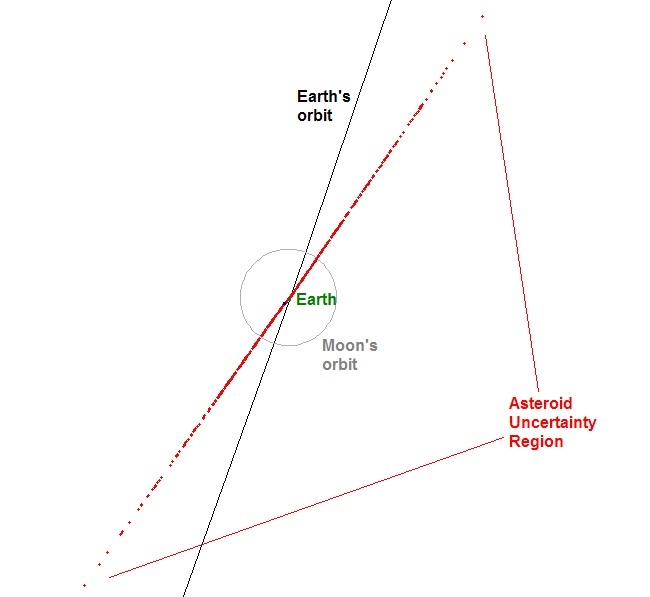 The uncertainty region is large because the asteroid has only been tracked for 2 months and the orbit uncertainties accumulate over the 7 years from observation to the time of the potential impact. 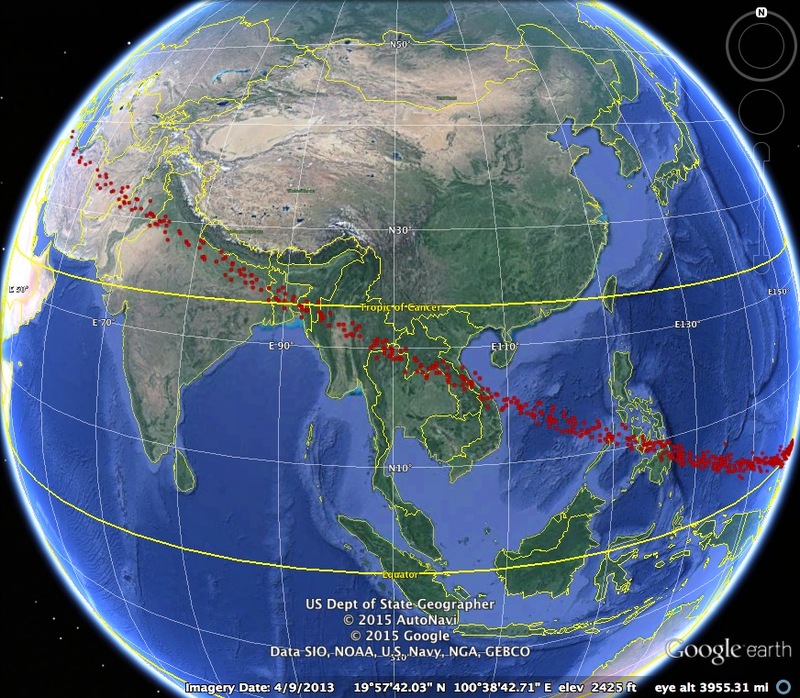 This pair of images shows the preliminary risk corridor, traced by the red dots. The corridor extends from the eastern Pacific Ocean, through the South Pacific, to the Philippines, South China Sea, Southeast Asia, Myanmar, Bangladesh, India, Pakistan, Afghanistan, Iran, and Turkey. In the unlikely event that the asteroid will impact the Earth, it will impact somewhere within the region traced by the red dots. The asteroid is first detected by the Catalina Sky Survey on April 13, 2015 (the first day of the 2015 IAA Planetary Defense Conference). The apparent magnitude at discovery is 20.9. After a second night of observations, the Minor Planet Center (MPC) announces the discovery, designates the asteroid “2015 PDC” and publishes an initial orbit in a Minor Planet Center Electronic Circular (MPEC). The MPC computes a small MOID (Minimum Orbit Intersection Distance), ~0.001 AU, and predicts a close approach of about 0.2 AU in the next four weeks. On April 15, JPL’s Sentry system and the NEODyS group’s CLOMON systems both detect a small chance of impact for this asteroid in 2022: the probability of impact is on the order of 1 in a million. The asteroid is added to the online risk pages for both of these systems. Over the following week, the asteroid continues to be observed, and estimates of its orbit become more accurate. The daily reports from Sentry and CLOMON show a slowly increasing probability. Ten days after discovery, the impact probability reaches about 1e-4, and the asteroid moves up to level 1 (green) on the Torino Scale. The orbit for this asteroid is somewhat eccentric (e = 0.49), but that’s not unusual for an Apollo asteroid. The perihelion distance is 0.90 AU, aphelion distance 2.65 AU, and orbital period 864 days (2.37 years). The potential impact occurs on the outbound leg, as it did for the Chelyabinsk impactor. The orbit for this asteroid can be viewed in the JPL orbit viewer here. The asteroid makes a close approach to the Earth on May 12, 2015 at a fairly distant 019 AU. It will not approach this close again until the encounter in 2022. 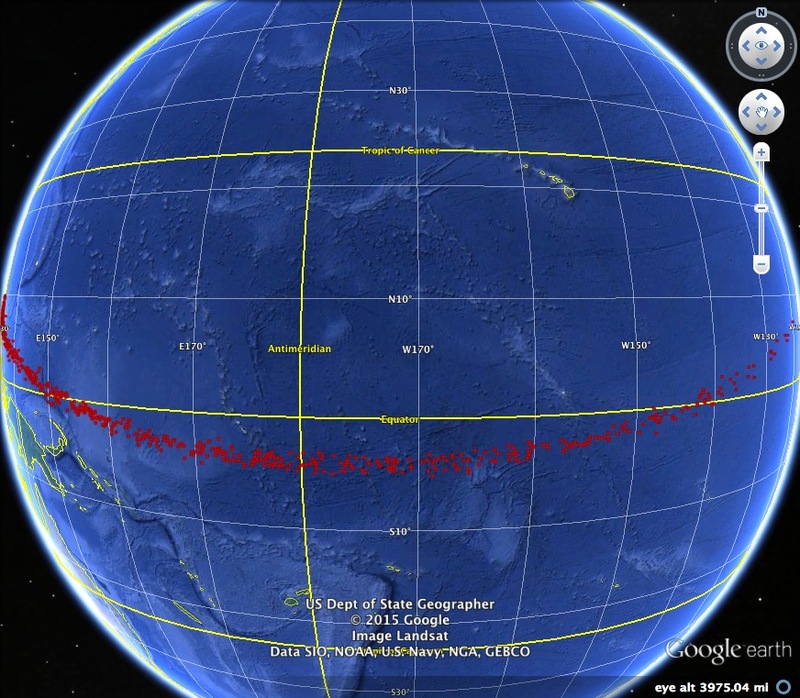 Its previous close approach to Earth was at about 0.13 AU in 1996. The asteroid peaked in brightness that year at apparent magnitude 20.9. Use JPL Horizons system to study this object.